Cognizant Company Information Is this your company? Add your own content to this page. We currently have 195 open jobs at Cognizant. 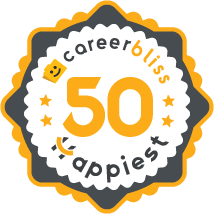 We've calculated that the average salary at Cognizant is $71K based on 1,630 user-submitted salaries A total of 650 Cognizant employees gave Cognizant an average happiness rating of 3.9 out of 5.0. 203 Programmer Analysts from Cognizant submitted salaries. 2.8 Make the team understand that if there is a problem, the world will not end. That if there is an issue that has you working until 8-10 PM, you don't have to work through the night to finish.There are never any rewards or acknowledgements of your hard work; you can put in a 24 hour day and your supervisor expects you to be able to pull another all nighter the next day. 3.7 I've worked for Cognizant since Aug 2009. It has been a very good learning experience for the past 5 yrs. I was given the chance to learn new technologies, suggest design changes and make a good contribution to my current client. The company has matured and is not appreciating innovation like it used to. Rewards & recognition has become more of satisfying the masses rather than appreciating real talent. Promotions have become the only way to get a salary hike and are allocated based on tenure. 4.5 I've worked with Cognizant from July 2005 to Oct 2012. It's an MNC and has best work culture. For 7 years Cognizant has groomed me into a professional QA Analyst with exposure to other aspects of industry like Business Analysis and IT Audits. I am glad to experience this journey. Cognizant Technology Solutions serves over 500 clients on five continents worldwide. Though Cognizant’s headquarters are located in the United States, the company has operations based in India and in other locations. The services are provided in nearly every industry. The new technology developed by the Cognizant Technologies is cost effective and comprehensive. Project collaboration is an essential aspect of Cognizant. Projects are well-planned and are delivered in a reasonable amount of time to clients. The IT departments and strategic consulting departments work together to transform the business. The process minimizes risk and disruption. Cognizant is headquartered in Teaneck, New Jersey. The company has over 50 delivery centers worldwide and 118,000 employees. Cognizant Technology is listed in the Fortune 500 companies and Forbes Global 2000. The organization is currently one of the fastest growing companies in the world. The company currently serves clients in the following industries: Healthcare, Banking, Communications, Energy and Utilities, Consumer Goods, Insurance, Retail, Manufacturing, Technology and Travel and Hospitality. Cognizant Business Consulting, IT Infrastructure Services, Business Process Outsourcing and Application Services are each offered by the company. Building a sustainable business is the primary goal. The business strives to do what is best for the people and the environment. Cognizant Business Consulting exhibits the highest standards of personal and corporate conduct. Cognizant culture focuses on maintaining integrity and providing exceptional service. The company is constantly challenging itself to devise solutions to maintain a competitive advantage globally. When global targets are met, business grows and revenue increases. Cognizant Technology was one of the fastest global IT services in 2006. The company reached $1 billion in less than 12 years. In 2007, the company acquired MarketRx. MarketRx contributed analytics and other related software services to the company. The company exceeded the $2 billion revenue threshold after the acquisition occurred. In 2008, Cognizant Technology exceeded $2.8 billion in revenue. In the same year, Cognizant was listed on the Fortune 1000. Cognizant later was added to Fortune’s Most Admired Companies list. They were also listed on the 25 Fastest Growing Technology Companies in America in Forbes Magazine for six consecutive years. Also in 2009, BusinessWeek added Cognizant Technology to the Top Performing United States companies for three consecutive years. Employees working at Cognizant Technology Solutions will find that Cognizant careers are rewarding in numerous aspects. Cognizant benefits packages are tailored to the company’s geographical regions.